This was my link to four fellow airmen who died so tragically many years ago. A few words in an insignificant technical document were my small attempt to perpetuate their memory. In the days following the loss of Jolly Green 23, I was haunted by Bob Dubois' description of the incident. His words, " ... the main rotor stopped ... , " ran through my mind, and I kept wondering what could have caused that to happen. Why would the rotor just seem to stop turning? Conversations with some of the Army helicopter pilots assigned to MACV Team 3 at Hué introduced me to the phenomenon of autorotation. I learned that a helicopter can "glide" after the loss of engine power. Just as a fixed-wing aircraft glides by exchanging potential energy (altitude) to overcome drag and maintain flying speed, a helicopter can use its altitude and airspeed to keep the rotational energy (RPM) of the rotor high enough to maintain flight. I also learned that under certain conditions it was possible for the rotor to rapidly decelerate and lose lift during autorotation. Click here for a more technical description of autorotation. Was this what happened to Jolly Green 23? I realized that I likely would never know, but my left-brain curiosity would not let it go. I wanted to learn more about helicopter aerodynamics and autorotation. Through an incredible stroke of luck, I was to get that chance. In early 1969 I learned that my application to teach aeronautics at my alma mater, the United States Air Force Academy, had been approved. To prepare for this, my immediate follow-on assignment from Vietnam was to graduate school in aero engineering at the Air Force Institute of Technology (AFIT) at Wright-Patterson AFB in Ohio. Since I already had one GI degree, I wanted to see what a civilian institution was like and asked the personnel officer at the Academy's Department of Aeronautics if I could specialize in vertical/short takeoff and landing (V/STOL) technology. This apparently fit a need they had, so he requested that AFIT send me to Princeton University instead. AFIT agreed, and in June 1969 I reported to Princeton to begin my studies. While at Princeton I was privileged to work with some great people. Dr. David Hazen, the associate chairman of the Department of Aerospace and Mechanical Sciences, was a friend of the military, and during some turbulent times on campus was able to guide and encourage me in my interest in helicopters. Dr. W. Z. "Steppy" Stepniewski, a visiting professor from Boeing Vertol and a pioneer in helicopter aerodynamics, became a valued mentor. I owe much to these gentlemen. The decision on a thesis topic was easy; it would be about autorotation. 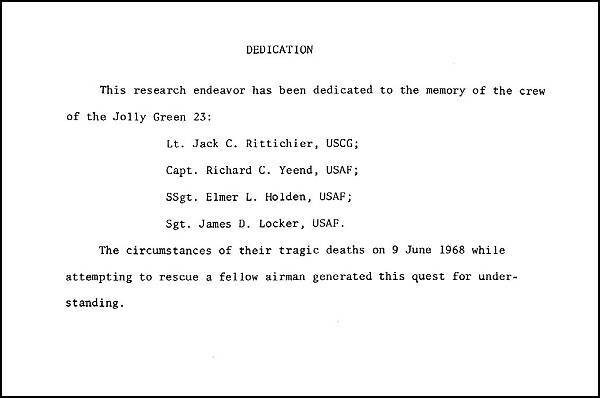 In the months that I did research on the topic, built an analytical model and then constructed and tested a rotor in a wind tunnel and free drop tower, I kept thinking about the crew of Jolly Green 23 and mentally drafting a dedication to them. In early 1971 I wrote to the commander of the 37th Air Rescue and Recovery squadron in Da Nang asking for information on the crew. When the reply came, I included their names in a dedication page to the thesis (shown above). Interestingly, no one at Princeton had ever seen a dedication like that on an engineering thesis. In June 1971 I completed my degree program at Princeton and moved on to the Air Force Academy in Colorado. I was given the rare opportunity for a "freshman" instructor to design and teach a special topics course on helicopter performance, stability and control. With the Vietnam War still in progress, this was a popular offering with the cadets. later I was able to teach the course for the four years I was on the Aero Department faculty, and it later was added as a permanent offering. Several of my students went on to train as helicopter pilots after graduation and became part of the great Jolly Green heritage. If somehow I was able to contribute to their decision, perhaps this was my small payback to the men of Jolly Green 23 for their sacrifice.